This game has a reputation: a bad one, but not from a playability stand point. 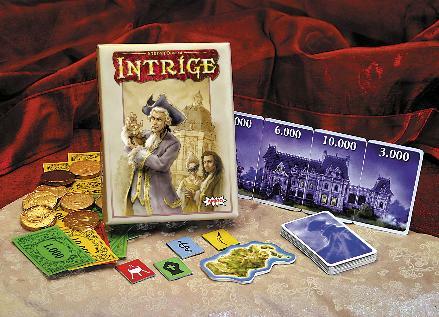 This pure negotiation game pits the players as Renaissance era families that are engaging in rampant nepotism. Players are seeking positions in the other families' businesses, and to further that pursuit players offer bribes. However, once accepting a bribe, the 'bought' player is under absolutely no obligation to honor the highest briber or any other verbal deal. In a word, this game is vicious. Great game as long as no one takes it personally. Then it's just nasty. I've not seen the new edition, which I am told is a card game. The components of the original are 5 player boards that show a building with 5 positions on it, with $10K, $20K, $30K, $50K and $100K salaries, 10 round cardboard tokens (2 each of 5 symbols) in 5 colors, large stack of money, and the Island.